Here's a perfect example of Old World coolness and not so coolness. 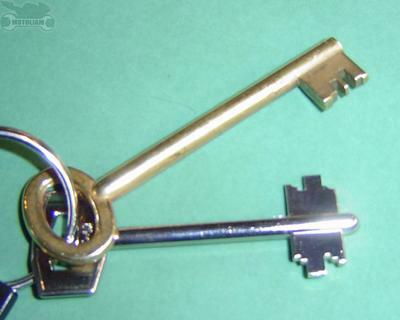 These are two of my house keys, one for the small lock, one for the deadbolt. The deadbolt is the two sided key and for something that looks so simple, it is suprisingly hard to pick, even with my Dyno Quick Pick. When I first arrived, the key I received was damaged, looking like it had gotten smashed under a car or something. No problem, I thought, and I proceeded to hammer it back into shape. A little bit of filing with a heavy duty nail file and I thought I was good to go. The key would turn the lock and the deadbolt would come out of the door, but it wouldn't go back in. The locks here work in "steps", meaning you turn the key one full turn and the bolt comes out one step. Two turns, two steps. All the way to four steps. Anyhow, my barbaric methods weren't working, so I tracked down a little Cerrajero (locksmith) and had him work on the key. One Euro later I was hustling back to the apt. only to find it didn't work. Back to the locksmith for another try (this one was free) and the "master" went to work, cutting, grinding, hammering, you name it. Still didn't work. I ended up buying a new key for 6 Euros and it worked. I honestly can't tell the difference between the old and new keys with the naked eye, but apparently there is a difference. Another strange thing about the locks? You slide the key in the slot and have to "find" the lock mechanism. If you're sloppy you can wriggle the key around for a long time and never get anywhere. All in all, these keys are pretty neat except for the fact that they're large and make your pocket bulge a little. I feel like I'm back in the days of the Smurfs, because these keys remind me of something Gargamel would use.